Be the first to share your favorite memory, photo or story of Reginald. This memorial page is dedicated for family, friends and future generations to celebrate the life of their loved one. 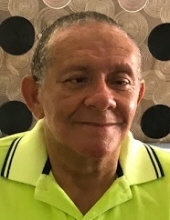 Brown, Reginald Jerome, 65, Ocala, Florida. Passed away January 14, 2019. Life Celebration for Mr. Brown will be held on Saturday, January 19, 2019, 2pm at Antioch Missionary Baptist Church, 2350 NE 140th St,Citra, FL 32113, Reverend Winston Dawson, Pastor. Reverend Carl Gadson will be conducting the words of comfort. Visitation will be at Sellers Funeral Home on Friday from 12pm to 6pm. Family and friends are asked to meet at Antioch Missionary Baptist Church at 1:30pm on Saturday to form the funeral cortege. No viewing following the eulogy. To send flowers or a remembrance gift to the family of Reginald Jerome Brown, please visit our Tribute Store. "Email Address" would like to share the life celebration of Reginald Jerome Brown. Click on the "link" to go to share a favorite memory or leave a condolence message for the family.